Here’s how you can downgrade iOS 10 beta back to iOS 9 public release on iPhone, iPad, iPod touch in a bunch of easy to follow steps. 1. Download the latest public iOS 9.x firmware file which Apple is still signing. At the time of writing it’s iOS 9.3.3. Also be sure to download the correct file that is tailored for your iOS device. Once the download is complete, save the file to your desktop for easier access later in the downgrade iOS 10 beta guide. 2. Download and install iTunes on your PC or Mac if you haven’t already. Go to apple.com/itunes to learn more. Once installed, launch it. 3. Connect your iPhone, iPad, iPod touch to your computer using a USB cable. Let your computer install the necessary drivers if prompted for them. 4. You’ll see your iOS device pop up at the top left hand corner of iTunes, click on it. 5. See that ‘Restore iPhone’ button at the center of iTunes? Click on it while holding down the left ‘Option’ key (Mac) or the left ‘Shift’ key (Windows). 6. A new pop-up box will come into view, asking you to select an IPSW firmware file. Simply double click on the iOS 9.x firmware file you saved on the desktop in step 1. 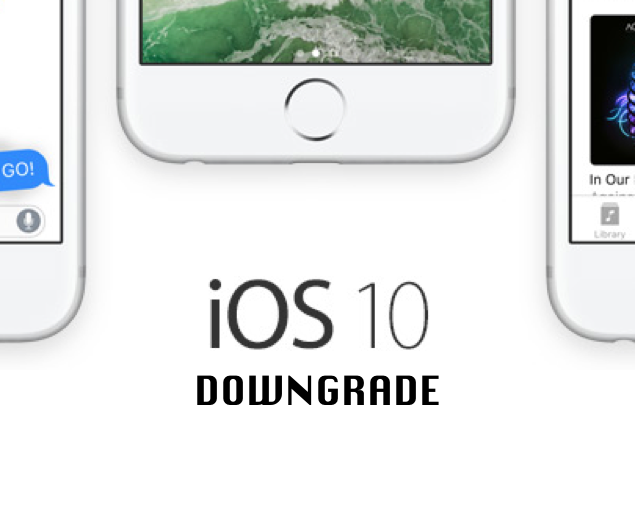 The downgrade iOS 10 beta process will now begin, and it will barely take a few minutes depending on the age of your iOS device and the speed of your Internet connection as well. Please make sure you do not touch your computer or iOS device when the downgrade iOS 10 beta process is in progress. You absolutely don’t want to mess around with anything at this point. Once the downgrade iOS 10 beta process is complete you’ll boot straight into the fresh site of iOS 9.x. Also, it should be worth mentioning here that you will lose every single file and data on your iOS device once you downgrade. Lastly, you cannot restore a backup you made on iOS 10 beta on a device that’s running iOS 9.x. iOS 10 beta is quite buggy at this point, and we will not give it a slight go ahead for use as a daily driver. If you’re planning to use it on a daily routine, then be vary of the issues that you might stumble across, with the top one being battery life. We recommend users to upgrade to iOS 10 beta once three or four builds are out, ensuring things are much more smoother for you compared to how they are today.